Tired of walking? Hop in a carriage! 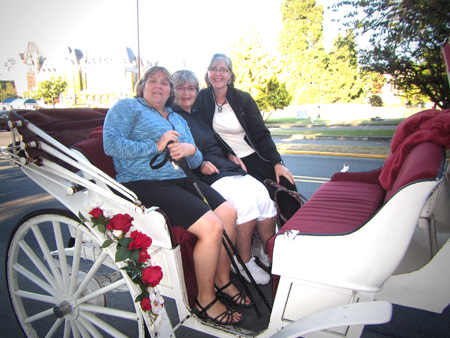 Recently my mom, sister and I went to Victoria, BC for a short girls’ getaway. We had a fantastic time and we did not need a car at all! We arrived from Port Angeles on the Black Ball Coho ferry. The ferry docks are right downtown in Victoria’s beautiful harbor area, at the heart of the tourist district. When you arrive on the ferry you see the famed Empress Hotel directly at the end of the harbor and the beautiful Parliament building to the south. Many hotels are situated right around the harbor. We stayed at the Harbour Towers (which we highly recommend for location and service), just a few minutes’ walk away from the ferry dock. There is a nice walking path along the harbor down to Fisherman’s Wharf. This trail is all sidewalk or boardwalk, making it a very easy stroll. At Fisherman’s Wharf you will find several tiny, brightly colored floating houses as well as some shops and restaurants. The walk continues around the south side of the island where you get a fantastic view of the Olympic Mountains and of any cruise ships that are docked in Victoria. On a clear day you can see all the way across to Port Angeles, Washington! We found it to be much cooler on that side of the island, with the breezes coming right off of the Straits of Juan de Fuca. The Ogden Point Breakwater is a great spot where you can walk out on a long pier. We also saw people basking in the sun and fishing out there. The inner harbor area has lots to offer: Parliament tours, restaurants, shopping, high tea at the Empress Hotel (of course we had to do that on our mother-daughter getaway), museums, whale watching and sailboat cruises, water taxis, float plane trips, and street performers. Just a short short walk from the harbor is Canada’s oldest Chinatown and the second oldest Chinatown on mainland North America. They say if you go through the gates of Victoria’s Chinatown you will have good luck. I felt pretty lucky just to go see them, so I guess it works. They also say that if an honest politician walks through the gate the lion statues will come to life. So far, apparently, they have not had to replace the lions. The very narrow Fan Tan Alley (from the movie Bird on a Wire) is also in Victoria’s Chinatown. A little farther from the central harbour, accessible by public bus or on a tour, are large parks, some art museums, popular shopping areas, and sights like the Craigdarroch Castle, a castle built in the Victorian era and nearly fully restored. We visited the castle on our hop on hop off Big Bus tour around the city. We had Groupons for the bus tour, so it only cost $20 per person. Tickets lasted all day. We could get on and get off at any of the 20 or so stops on the route. It was a fun way to see a lot of the city and gave us a chance to get off and explore when we wanted to. 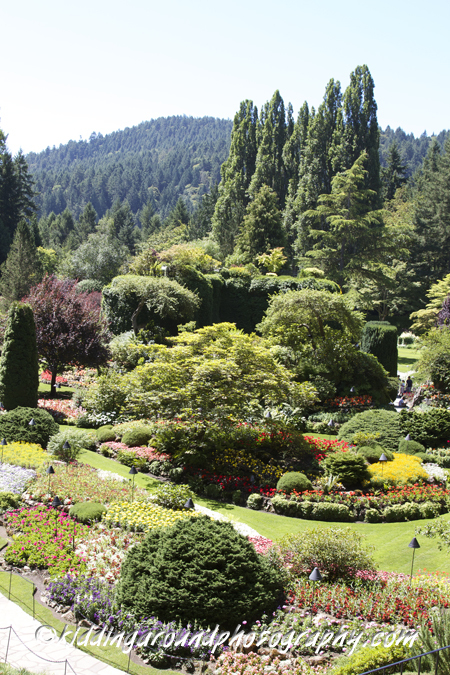 We also did a bus tour to Butchart Gardens. This incredible garden can be reached by public bus as well, but the tour was just a little bit easier for us, so we took that option. The bus tours include the entrance fee to the gardens (which is about $38 alone). We had considered renting a car to get to the gardens but when we added up the cost of entry and the bus, it would’ve been about a push to rent a car, and this way we did not have to do any navigating or driving. Going on the public bus would be a much less expensive option, although you would obviously still have to pay the entrance fee to the gardens themselves. We spent three days and three nights in Victoria, and we really did not miss having a car there at all. Plus, we got to have a few more guilt free bites of dessert at high tea because we were doing so much walking. Can’t beat that! What walkable cities have you visited? Leave us a note in the comments, and enjoy your next travel adventure, whether it’s for a week or a weekend. Great info on Victoria – this is a trip my mom and I do as often as we can – which is not enough! I don’t think there is a more spectacular ferry arrival than coming into the Inner Harbor with the Empress and the Parliament Building. It just doesn’t get any grander than that. If you close your eyes for a moment you can imagine what it must have been like to arrive in this stately city 100 years ago.